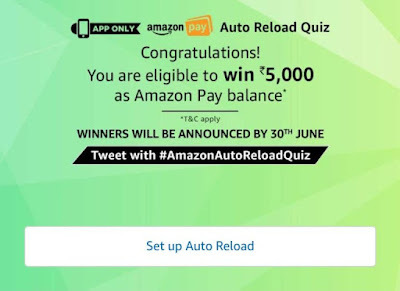 Amazon Auto Reload Quiz, Amazon Auto Reload Quiz Answers – Hi Guys, Hope You All Are Doing Wonderful With Us With Our Stunning Free Recharge Loots & Free Shopping Loots. 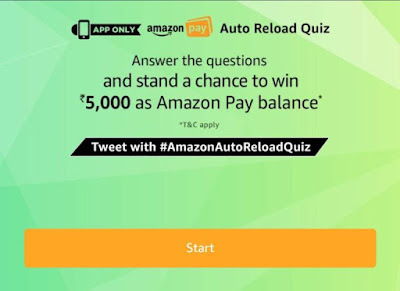 Meanwhile, Amazon Has Announced Another Quiz Today That is Amazon Auto Reload Quiz. 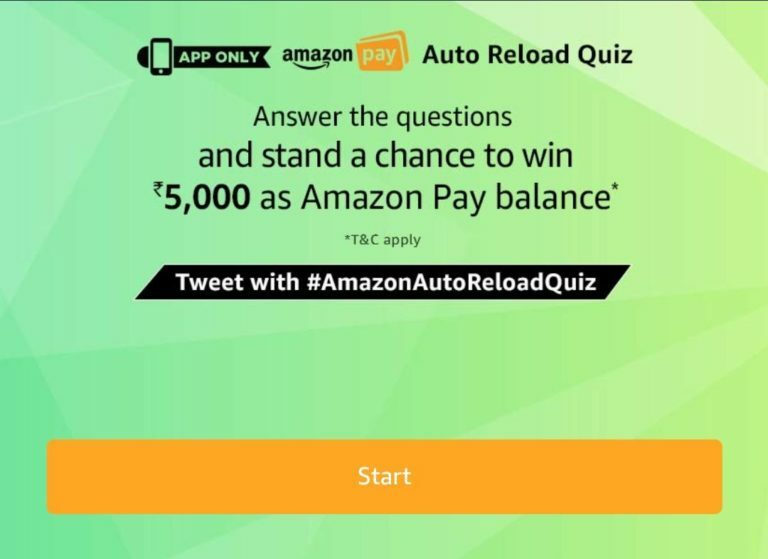 The Quiz is Based On Amazon Auto Reload Feature In Their Amazon Pay Wallet. For Your Kind Knowledge , With Amazon Auto Reload Feature of Amazon You Can Reload Your Amazon Pay Wallet Every Month With All Debit & Credit Cards To Enjoy The Cashback Offers Going On Amazon Pay Balance & Amazon Recharge. 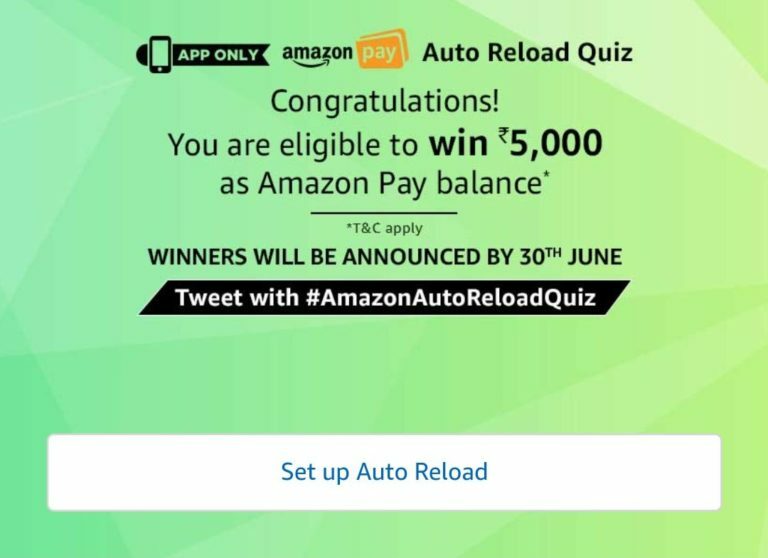 Now Amazon is Giving Chance to Win Free Rs.5000 Amazon Pay Balance By Participating In This Amazon Auto Reload Quiz. All You have to do is Choose Right Answers to 5 Questions Of This Quiz. Total 40 Winners Will Be Choosen By Amazon & They Will Get Rs.5000 Direct In Their Amazon Pay Wallet. Now Select The Answers As Written in Below Order. 2. Which of the following is NOT a benefit of setting up Auto Reload? 3. Currently, on setting up Auto Reload for Rs. 1000 or more, what is the cashback offer you can avail? 4. What is the minimum amount that can be set for Auto Reload top ups? 5. Which of the following payment methods can be used to setup Auto Reload? The declared winner(s) will be eligible for winning Rs.5,000 as Amazon Pay balance (hereinafter referred to as “Prize(s)”).